The trend continues, and two of New York’s top law schools are joining in. Cornell Law School recently announced that in addition to LSAT scores, it will now accept both GRE and GMAT scores. NYU also said that it will begin accepting GRE scores for the incoming 2019 class. The addition of Cornell and NYU bring the total to seven of New York’s 15 law schools that are accepting the GRE in additional to the LSAT – and all three of their top tier schools. There are now 22 schools throughout the U.S. where applicants can send in either LSAT or GRE results. Cornell joins the University of Pennsylvania Law School as the only two programs accepting the GMAT as well for traditional JD admissions. Cornell has decided to begin slowly, by capping the number of admissions with GRE or GMAT scores at 20 for the incoming class of 2019. This accounts for approximately 10% of the class. While NYU is not limiting the number of admissions with GRE scores, the school assumes that, at least for now, the majority of applicants will still take the LSAT. “This is something we have been considering for some time, and now we are ready to move forward in the process and accept the GRE,” said Assistant Dean for Admissions Cassandra Williams. The LSAT began to lose dominance in 2016 when the University of Arizona James E. Rogers College of Law became the first law school to accept GRE scores. Twenty-one other schools have also changed their admissions requirements since then, including Harvard Law School, Northwestern, and Georgetown University Law Center. If University of Pennsylvania and Cornell are any indication, the GMAT will also soon become a competitor of the LSAT. Allowing GMAT scores, which are used for admissions to business schools, will allow law schools to deepen their potential admissions pool. Law schools are now showing a special interest in students with backgrounds in STEM – science, technology, engineering, and math. According to Williams, accepting the GRE is one way NYU is hoping to attract these students. Another NYU initiative is increasing the funding for scholarships for those interested in patent law, intellectual property, or cybersecurity. Allowing the GRE also makes test-taking easier for potential students. While the LSAT is given six times a year and on paper, the GRE is offered on a rolling basis throughout the year and is given on computer. The GMAT is given on demand via computer. The statistics from 2017 bear out the notion that alternative tests will attract more applicants. According to GRE developer Educational Testing Service (EST), 447,580 students took the GRE in the U.S. The number who took the GMAT was 79,862. During the same period, the LSAT was administered 129,200 times, which includes students who took the test more than once. Even the American Bar Association (ABA) is accepting that the change is inevitable. At its meeting next month, the ABA is considering eliminating the requirement that law schools use LSAT scores for admission. Do you need help with your law school application? Our expert admissions consultants can assist you every step of the way! 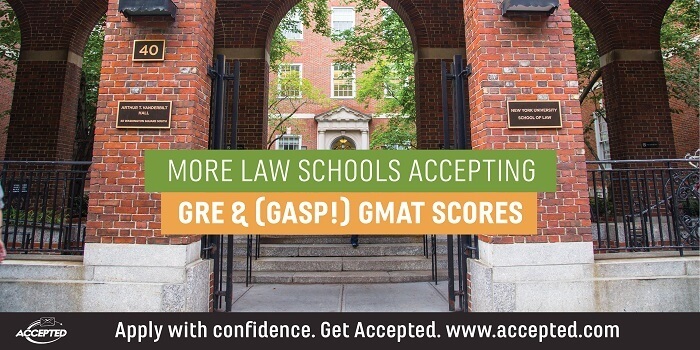 Check out our Law School Admissions Consulting Services to learn more about how we can help you get ACCEPTED.